Wakefield Ladies captain Dani Swaine in action last season. The newly-appointed Wakefield Trinity Ladies captain had just completed an unbeaten treble-winning season with hometown club Bradford Bulls. Dani Swaine, bottom left of front row, in her early days with Bradford Bulls. The Bulls won the Challenge Cup, League Leaders’ Shield and the first-ever Women’s Grand Final in 2017. Swaine played a key part in the success but decided to call it a day, finishing - what she thought - on the ultimate high. However, 18 months on and the Trinity forward finds herself just days away from a Super League return as Wakefield Trinity Ladies prepare for their first-ever top-flight game at Leeds Rhinos. “I thought I had hung up my boots for good but I was missing the game,” admitted Swaine. Wakefield Ladies 2019 Women's Super League squad. “For me, I wanted to finish on a high but I know how much I missed rugby league and wanted to progress the game. The Wakefield skipper “never ever imagined” playing for anyone other than Bradford, after starting out as an under-16 player for the club. However, Swaine now resides in Pontefract and after missing just one pre-season programme, she found herself back playing rugby with Wakefield in the Women’s Championship. “I was born in Bradford and grew up in Bradford,” she continued. “But being given the opportunity to play for Wakefield feels good. Wakefield Trintiy Ladies won the League Leaders’ Shield in the Women’s Championship last season but missed the chance at a Grand Final appearance after losing their play-off semi-final to Leigh Miners Rangers. They met Sunday’s opponents Leeds Rhinos in the Challenge Cup last season, losing 58-0. “We are aware that we are the underdogs when we play teams like Leeds,” said Swaine. “But we are not going to worry about that, we just need to concentrate on our own performance. “The score will be whatever it will be but we are confident. “We just want to get it out of the way. After last year’s performance in the Cup, we are excited to see how far we have progressed. 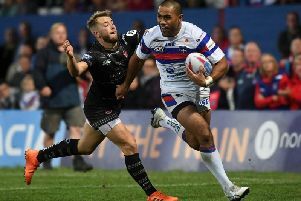 Wakefield make up an eight-team Super League in 2019, with other local derbies against Featherstone Rovers and Castleford Tigers to look forward to. Trinity are the only new side to enter the competition ahead of the new season and Swaine says they will be satisfied with a mid-table finish. She said: “The other teams are two, three if not four or five years ahead of us. “They are well established and I would be quite happy with a mid-league finish. “We have four or five 16-year-olds playing for us this season, so we know that is a big step up for them. “And we have got some new players, our focus for this season is to develop and gel. Swaine feels that the progression of the women’s game in recent years has been nothing short of remarkable. The forward has been sponsored by Craig Michael Fitness for the duration of the 2019 campaign and added: “It just shows how far the women’s game has developed over the years. All my career I have had to fund everything myself, with the help from my parents, so to have a sponsor backing me is fantastic.